It is not known when a brickmaking facility was first established in Otterton. or where it was sited. At the Tithe Award 1843/46 the site of what became the brickyard in the later 19th.century was held by Otterton’s Vicar, Revd. John Moore Stephens as pasture Tithe No. 903- Hawkerland 1ac.3R 23P. In the corner of this field was No. 902 –“Pond & Waste”. Also No.906 Pathfield 2ac. He probably used it for his horse and it was not part of the Glebelands. He paid a Rack Rent for it, £28.10/-pa. It is possible there was a brickmaker in Otterton in centuries past, but evidence has not yet come to light. In 1865 Revd. Moore Stevens died and in the same year Robert Lipscombe took over as Estate Steward. His predecessor Samuel Taylor Coldridge had already set in motion rebuilding of some of the Estate tenanted farms. On taking over in 1865, Mr. Lipscombe was faced with ordering bricks in January 1866 from Mr. Burridge, builder of Exmouth who had a brickyard at Woodbury. This was followed by a supply of pipes “120ft of 9 inch collar pipes” in the following March. This suggests there was not a brickyard controlled directly by the Estate. The site vacated by the late Vicar was taken over for that purpose and by December a brick yard was up and running. The rebuilding project was to be extended to most Estate Farms and very many cottages and the whole project took 42 years from 1863 to 1905. Altogether over 80 buildings in the Lower Otter Valley and more in the North Devon Estate and at Beer were built. The majority carry a plaque “M.R.” and the date when completed, MR being the initials of Hon.Mark Rolle, who with the Stewards had instigated the project. In 1866 Mr. Jackson is having the Rolle Hotel in Budleigh Salterton rebuilt and is ordering 12,000 bricks from the Otterton Yard. A year later William Please of Exmouth is applying for”a berth as a brick & tile burner” and Mr.Lipscombe is writing to Mark Rolle that he is setting up a tilery at the Yard “where present kiln will, with repairs, serve for several years”. Mr.Please was engaged as the Yard Manager in 1867 and stayed there until its closure in 1903.In a letter written to the Estates London Solicitors in February 1868 he states “I have started a tilery on our own account, as we pay through the nose for pipes from neighbouring tileries..........I never heard of an Estate of this size which had no tilery” Price lists and patterns of drain making machines are being asked from Messrs. Whiteheads and Pug Mills and other furnishings for a tilery. “Only a hand machine was required which will be moved up and down the shed”.“I do not propose making larger sizes than 6 inch pipes with the machine”. By November 1868 the Yard has supplied 101,850 bricks to 2 Local Builders. It was during the 1860’s that the Estate was planning its rebuilding programme already mentioned and in April 1864 the Exeter Flying Post has an advertisement from the Estate inviting builders to tender for erection of new farm buildings. Lower Pinn Farmhouse was built at this time, probably bricks from the Yard were used by the builders employed. On Mr. Lipscombe’s appointment as Steward in 1865 rebuilding began in earnest and for the next 38 years the Yard was supplying the necessary bricks, tiles, pipes etc. required. By November 1868, William Please was managing the Yard and Mr. Lipscombe is writing to him “ Next seasons arrangements for supplying the Rolle Estates with bricks, pipes etc. ...I shall have to advance money to you as the season goes on, as the coals will be a heavy expense.........I think it will be best that I should supply the coal and I propose to get a cargo to land them at Larderham and delivery them into the brickyard. You will therefore have the coal and the clay and the use of all the plant gratis. – also a cottage and coals for consumption, also as much of the ground behind the sheds as we may not require for the purposes of the brick and tiles – also we will maintain the kiln, the shed and your cottage in repair unless wilful damage is done to them.. You should provide your own horse and keep it. Keep plant in repair except kiln sheds and machinery”. The annual account for 1870 shows a profit of over £280 , with a footnote “Have not succeeded in making brown tile for roofing yet”. It is evident that business is on the increase at this time and in March 1871 Mr.Please is offered Hawkern Field adjoining the “bricky” at £10pa rent (lately occupied by Nicholas Drake, butcher). 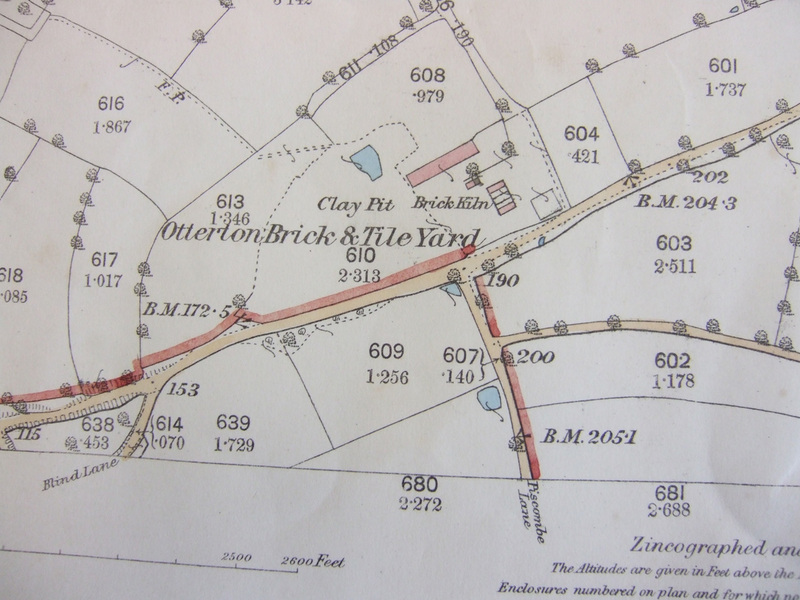 During the 1870’s the Yard was continually supplying K.Phillips, a Woodbury builder, who also had a brickyard at Sowhill Farm, which he closed in 1879, presumably as the Otterton Yard bricks were cheaper. In May 1872 Messrs. Stephens & Kendrick of Newcastle on Tyne, the Company shipping the coal from West Hartlepool, are getting concerned at the problems delivering it at Larderham and are proposing to discharge it at Budleigh Salterton , where presumably they deliver to the Limekilns there, or at Sidmouth. Mr. Lipscombe is adamant that “it is not one bit more dangerous than either of them, nor have I had either difficulty delay or complaint in discharging coal for years past.....every days delay is putting me to great inconvenience as well as loss.....I must withdraw the order if you cannot get a vessel within a week from this date”. 1877 the Tilery was supplying Bricks, Brick Bats, waste Bricks, Pipes, Tiles, Flooring tiles. Drain pipes, pan tiles and 9” squares at 3d each. July 1874 the London & South West Railway (LSWR) opened their branch line from Feniton to Sidmouth via Tipton St. John’s station and Messrs. Miller, Lilley & Madge established a Coal Yard there. Two years later they are quoting prices for delivery of coal to the Estate and receive the curt reply from Mr. Lipscombe that they have a “cargo delivery coming from West Hartlepool”. May 1877 they try again and Mr. Lipscombe replies “The close proximity of Mr. Rolle’s Tilery to Larderham Bay enables me to get the best Durham coal cheaper than you or any other firm can afford to supply a good coal at Tipton or Exmouth”. But he does ask for “a few tons for present use”. From 1878 competition for supplying coal to the Yard has increased. Miller & Co., Tipton: Keslake at Exmouth, who appears to have taken over Sage’s business and the Hartlepool suppliers, are all competing. Kerslake supplies 200 tons at 23/- per ton, but Mr. Lipscombe is trying to get it reduced “as freights are only 8/6d to 9/- and price of coal is down. Others have offered less”. 1881 he is accepting 22/9d per ton “not exceeding 150 tons of 1st. Class house coal”. By April 1882 the price is down to 22/3d. August 1881 flat tiles are being ordered for the North Devon Estate, weighing about 15 tons to be carted to Tipton Station for transit. Mr. Lipscombe writes to Mr. Please” there was a terrible breakage last (time) but I think it chiefly occurred at Tipton from the truck being shunted when only three parts loaded. You must use plenty of sawdust”. October 1881 Thomas Follett, mason, is repairing the kiln at cost of 3/6d. September 1882 John Small at Kingston Farm, Colaton Raleigh is requesting that Mr. Lipscombe gives him pantiles for his shed, which he refuses. Mr. Small will have to pay for them “Market price 60/- per 1,000. They cost 46/- to manufacture and will sell them to you at that price”. December 1884 letters written to Revd, William Green, Vicar of East Budleigh and to Mr. Please asking to supply £5 of coal (ie. 4 ½ tons), to be carted from Otterton Tilery by farmers for distribution among the people of East Budleigh. This must have been a bad winter. The 1884 Accounts Ledger quote that Mr, Please is paid £10 every two weeks to 12th. April, increased to £12 to 24th. May. Then £15 to 11th. October, then £12 to 22nd. November, then £10 to year end. Additional items :- W.White for repairing Brick Kiln - £1.13/- : B.Keslake, Budleigh Salterton for cargo coal, 164 tons @ 22/9d - £186.11/-: Miller & Lilley, Ottery St. Mary, coal - £33.19.11d An interesting letter to Mr.H.E.Roberts dated 22nd,October 1885 tells him about brickmaking “you can’t make brick without clay, sand, water and coals.” A visit to “Mr. Please would soon tell you all you want to know. I pay him 14/- per 1,000 for digging the clay carting in and mixing from 25 to 33% of sand from a distance of about 200 yards, Making burning and delivering the brick and as the coal costs about 7/- per 1,000, 21/- is about the cost per 1,000 and 25/- per 1,000 leaves a fair profit when with to meet interest on capital, wear and tear of kiln loss of land etc. – and therefore 30/- is a proper price and is what I should charge if I rented the whole concern from Mr. Rolle and had to bear the losses of bad debts etc.” The clay used was dug primarily from pits on the south side of Ladram Road. The 30/- per 1,000 is quoted in letters to W. Clotworthy July 1886 demanding payment of his brick account, “already many months credit”. By March 1887 Mr. Clotworthy must have paid his debt, for he is being offered “12,000 bricks at £5 within one month of delivery and balance at 30/- per month.” January 1887 to Mr. Please “Weather has been very trying of late, to any brick of tileyard which has been exposed to it, but I have had so many bricks etc.of ours perished away that I am sure that you are not giving them quite enough fire and I wish to give them more fire in future”. 1889 Kings Arms, Otterton to Tom Rogers, 20,000 Pantiles & Flooring squares to Mr.Hill. “I have no intention of selling any bricks to Budleigh Salterton builders. I hold myself at liberty to sell bricks to anyone especially if you or other brickmakers charge higher for bricks”- Presumably Marchant was concerned that the Otterton Yard was selling bricks cheaper to his wealthy Salterton customers. April 1897 to Mr. Please “The bricks in the first kiln must be burnt with Exmouth coal as usual. After 14 May coal can be had from Budleigh Station (Otterton – when railway opens)”. 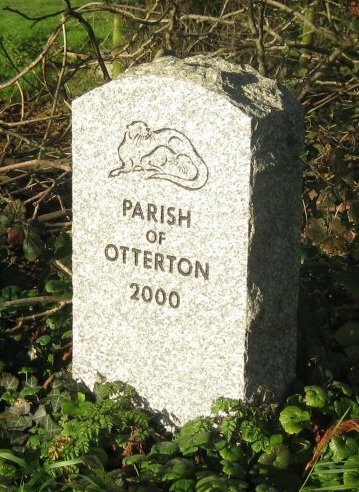 Otterton Tilery closed down in 1903. William Please was aged 73. On closure William Please’s son, Percy Hooper Please, age 27, who had been working as a tilemaker, then leased the land for farming. At the 1891 Census James Welsford (age 48) and his son Henry a tilemaker, were working at the Brickyard. They were living at No1 (now No.9). The Green. By 1902 the Welsfords had a newsagents business here. When her father died in 1928 his daughter Georgina moved to No.5 (now No.7) and continued the newsagents & confectionary business. Also at the Yard in 1891 was Edward Russell age 40 Brickyard Labourer of Colaton Raleigh. In December 1919 Frances and Florence Durham(sisters) leased the land and built Hawkern on it. The Misses Durham were benefactors to the village, especially the School, regularly presenting prizes to pupils. Miss Frances as a member of Devon County Councils Education Committee, took a great deal of interest in the conditions in village schools. They were also very conscious of the need to preserve the general appearance of the village, particularly the preservation of the old thatched farmhouses and cottages. They had been unable to stop, in 1938/39, the demolition of the cottages on the north of the Green, and the block opposite the Isaac Trust Houses in 1937. 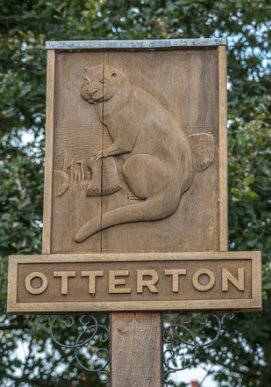 In November they were complaining to the Council for the preservation of Rural England about this and managed to get Otterton scheduled as a Special Village Area – the forerunner of the Conservation Area in which the village is now designated. “Mark Rolle. His Architectural Legacy” by Alan Ford 2001 Otter Valley Assn.